The cascade pendant represents the cascading waterfalls outside of Tiruntan in the Peruvian Amazon. Three circles of blues cascade downwards, joined by delicate drops of silver. 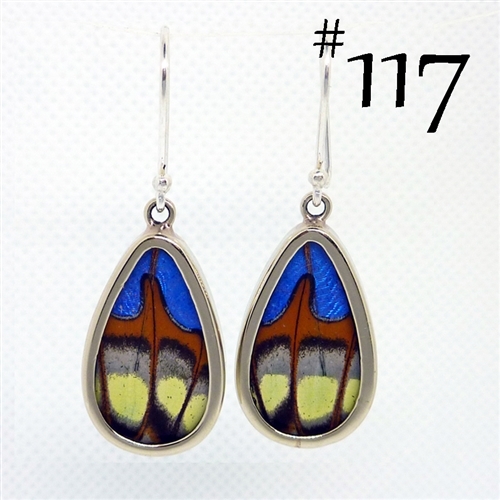 The butterfly wing "Cascade" pendant is sold by itself, or with a fine 950 sterling silver chain (and get a discount). Species: Blue Morpho / Morpho Sulkowskyi - The first circle of the Cascade pendant uses the edge of the blue Morpho wing and the light transparent blues of the Morpho Sulkowskyi, a beautiful contrast. The second circle uses the light color changing blue of the Morpho Sulkowskyi, and the final and smallest circle uses the bright blue of the blue Morpho.